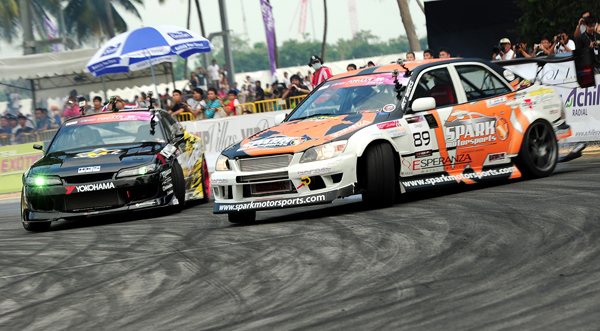 1 JULY 2012 (SINGAPORE): Achilles Formula Drift Singapore 2012 came to a pulsating end with reigning champion Daigo Saito from Japan, hoisting the trophy once again here at the Changi Exhibition Centre in front of more than 9,000 fans over the two-day competition. The fans in the stands were clearly up for some thrilling drift action, and the drivers did not disappoint as they pushed themselves to the limit in the Round of 32 on the new course. Saito, who finished top of the Qualifying Round with a score of 92 on Saturday, received a bye and dispatched Malaysia’s Muhammad Zaiham Hamdan in his 2001 Nissan Silvia in the Round of 16. He followed up with convincing wins against Emmanuel Adwitya Amandio from Indonesia in the quarter-finals and Robbie Nishida in the semi-finals. The surprise of the day was Indonesia’s Rio Saputro Budihardjo driving in his Nissan Cefiro A31 who gave notice to the competition as the second seed going into today’s Round of 32. Budihardjo continued his superb form, storming into the Final after taking out Malaysia’s Ser Ming Hui and crowd favourite Ken Gushi from the USA in the Round of 16 and top eight respectively. With a roaring crowd behind them, Saito and Budihardjo revved up their engines for the Final. In the first tandem run, the Indonesian spun out and the reigning champion put himself in the lead. However, in the reverse run, Daigo was penalized for straightening out at the final clipping point, forcing the finalists to a One More Time. In the second run, Daigo jumped out to take his line early to put a sizable lead ahead of Rio, leaving the Indonesian with too much distance to catch up. With the pressure on the rookie, Rio spun out and the Japanese claimed his second Achilles Formula Drift Singapore title after his success last year. A humble Saito said: “I am pleased to win the Achilles Formula Drift Singapore for a second time and it was a tough final against Budihardjo. He has been in great form all weekend and I had to focus and give it my best shot to retain the title. I have always enjoyed the event here in Singapore as the crowd is always cheering us on and I will definitely be back for more.” “Of course I am very happy and thrilled to have made it all the way to the Finals. I have always looked up at Daigo as a role model and he is one of the strongest competitors in the world. I had to push my car to the limit just to match him and as a result, I spun out. But the result is still a great one for me and my team.” chirped Budihardjo. Malaysia’s Hanizam Bin Hamzah finished on the podium after beating Robbie Nishida of the USA in a tight battle for third place.On the local front, only Singapore’s Jansen Tan advanced to the Round of 16 after beating Malaysia’s Rocker Loh Swee Hwa. However, he had the unenviable task of going against a one of the event favourites Ken Gushi in the Round of 16 where the American star flexed his muscles to seal his spot in the top eight. The Achilles Formula Drift Singapore 2012 also saw Team USA comprising of Ken Gushi and Robbie Nishida winning the first ever Canon Nations Cup in Singapore ahead of Daigo Saito and Manabu Orido from Team Japan. 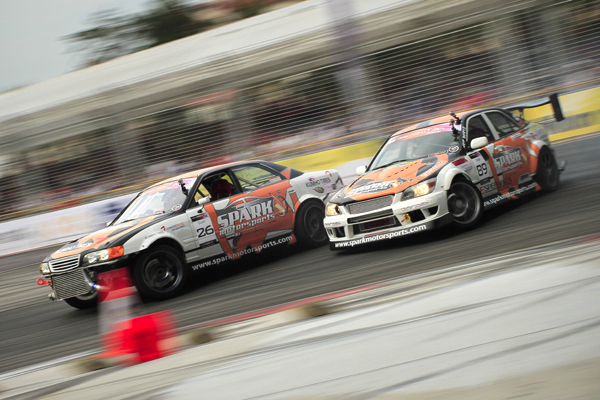 Singapore’s duo of Jansen Tan and Ivan Lim finished in third place to close out a very successful second leg of the Asian Drift Series 2012. 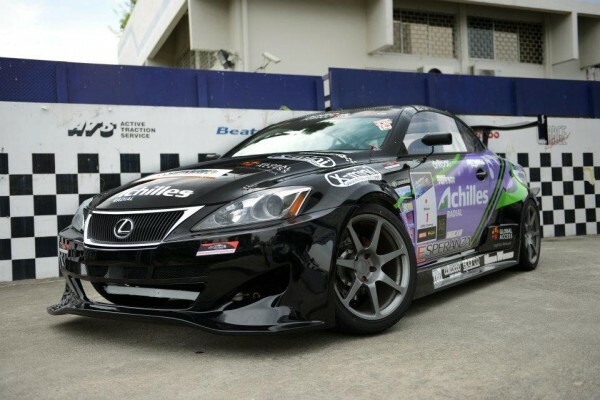 The Achilles Formula Drift Series will now move on to the third leg of the series in Bangkok, Thailand with the final leg set to take place in Jakarta, Indonesia where stars like Saito, Orido and Nishida are set to thrill the drift fans once again with some pulsating drift action. 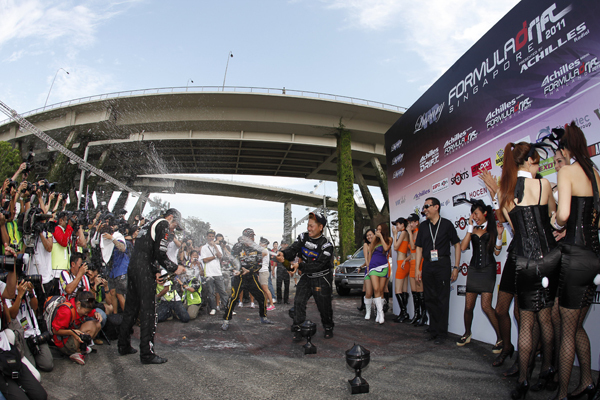 Singapore, 12 June 2011 – Daigo Saito of Team Spark Motorsports joined the pantheon of champions, becoming only the third driver to take the much-coveted crown of the fourth edition of VIP Formula Drift Singapore 2011 Presented by Achilles Radial at the F1 Pit Building today. It was a double victory for the team, with the Japanese champion and third-place winner Ken Gushi (USA) propelling Team Spark Motorsports’s charge to take home the inaugural Team Championship trophy with 183 points. 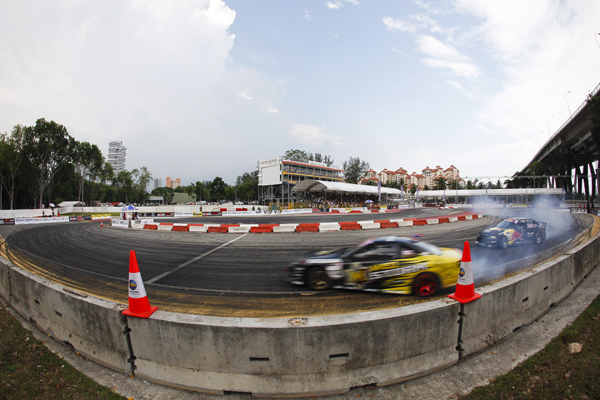 Singapore is the first formula drift championship in the world to introduce the award for the best team performance. Following two days of intense competition and volatile weather, Daigo showed consistency and the highest level of precision and car control, conquering the challenging track. Going neck-to-neck with Thai Saranon Pornpatanarak of Team M150 in the final face-off, the Japanese set the tone in the first tandem battle, chasing Saranon and staying mere inches from the Thai – drawing a huge round of applause from the crowd. In the second run, Daigo sped ahead to create an impossible gap for Saranon to match his competitor’s move, securing his first victory in Singapore with aplomb. Bright sunshine made for a welcome change from yesterday’s thunderstorms, as fans were once again treated to a world-class display of drifting prowess. With engines revving high and tyres burning furiously, the crowd had lots to cheer about as the tandem battles began in the morning. Unlike qualifying yesterday, which was based on the driver’s individual runs on track, today’s format was the tandem drift battles where drivers do two laps in tandem, each taking a turn to lead and fighting for the best score across two runs. The drivers were judged on their speed, style, and ability to maintain their drift angle for as long as possible. Battles are always tight and nail-biting, with chasing drivers pushing the limits and trying to better the lead driver. Organised by ESPN STAR Sports Event Management Group, the Singapore event is the first of a four-leg series for Achilles Asian Drift Series which will be followed by events in Indonesia in October, Thailand in November and the year-end Grand Finale this December in Malaysia. 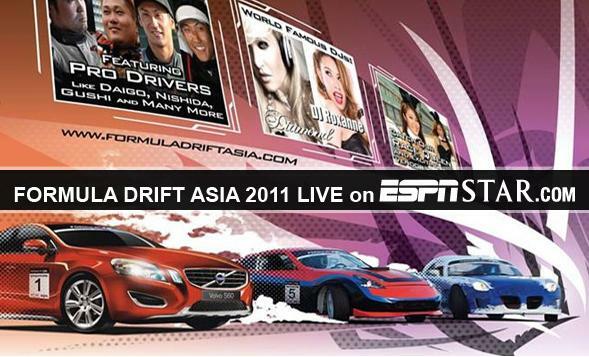 Please visit www.formuladriftasia.com for more details about the event. Watch the action from Singapore Live this weekend. Go to www.espnstar.com/live.